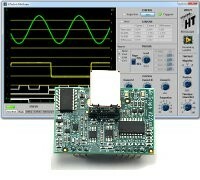 Weiterführende Links zu "HiTechnic MiniScope"
An oscilloscope is one of the most commonly used measurement instruments used in the electronics industry. At the most fundamental level, an oscilloscope enables the variation of an electronic signal with time to be viewed as a graph. This means that waveforms can be readily displayed and analyzed. The HiTechnic MiniScope is specially designed to work with the SuperPro board. It fits into a standard breadboard making it easy to use with testing new circuits. In this circuit, the SuperPro analog outputs O0 and O1 are wired into channels A and B on the MiniScope. Note that the signal from O0 is filtered through a capacitor. The SuperPro binary outputs B0 to B3 are wired to the four binary inputs on the MiniScope. Here two analog signals are displayed. Channel A is a sine wave while Channel B is a square wave. Note that the trigger is set on Channel B to start capturing when there is a positive slope going above 1.6 volts. Click to download/view pdf document. Note: the application guide assumes access to a HiTechnic SuperPro in order to generate the sample signals. Without a SuperPro the MiniScope can still be useful since if can be used on any standard breadboard to analyze signals from electronic circuits. The HiTechnic MiniScope board, SuperPro board, and electronic components may be damaged by static electricity so care must be taken when handling these components to avoid static discharge.